I only managed to catch pieces of the conference via Twitter during the day and I am still watching the keynote now. 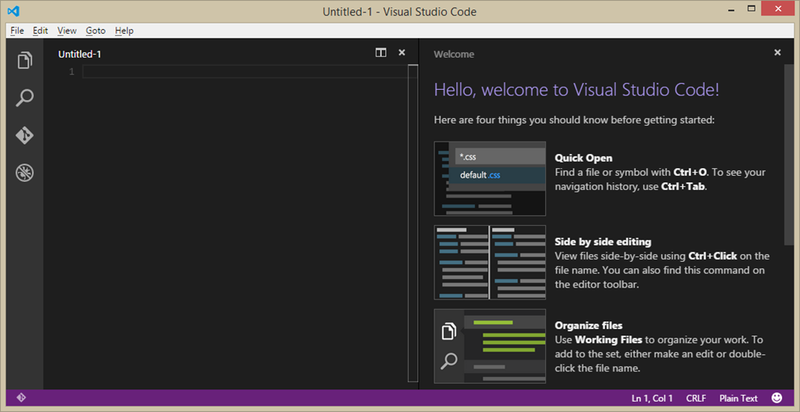 However the one piece of news that jumped right out at me was the release of Visual Studio Code. Code enables developers, for the first time, access to a pure cross platform code-editing and debugging environment. This support extends to OSX, Linux and of course Windows … running natively … mind blown! To be sure this is no Visual Studio Pro IDE, and for those of us coming out of this type of environment it will seem a little sparse. [ASIDE: I think editors need to be plugin based and/or hackable, and in the hands of the developers who use them most]. However, thinking about the bigger picture this still stands as quite an amazing feat. The developer focus is on the web, but unlike some alternatives IDE’s special attention has been given to the debugging environment, which provides features like Breakpoints, Data inspection, Debug actions. "Debugging is the most popular feature in Visual Studio, and often the one feature from an IDE that developers want in a leaner coding experience. Visual Studio Code includes a streamlined, integrated debugging experience, with support for Node.js debugging in the Preview, and more to come later... Code uses a newer, faster version of the same industrial-strength HTML-based editor that has powered the “Monaco” cloud editor, Internet Explorer's F12 Tools, and other projects." The install on Windows took seconds and I was immediately presented with an accessible (non intimidating), bare bones IDE and this was very refreshing. The light weight IDE is snappy and opens instantaneously, again this is no VS Pro. Code also has integrated support for git (needs local git installation), so you can manage your code commit while you develop. The install process for Code is, as you would expect, different on each operating system (Mono is needed for OSX and Linux, for example). Oh and it is completely FREE to download today!!! Well, Congratulation Linus, but today I think we all won! Download link for Linux is here, and OS X can be found here.